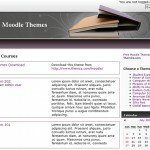 The Knowledge Library Moodle theme is now available for free download on ThemZa.com. You can download it now from our post. Await the new Moodle template by ThemZa – Knowledge Library. Check out what are the layout features and key functionalities supported by the new theme.